This role has joined many international peace programmes and emergencies in developing countries, such as Afghanistan, and led a number of significant policy initiatives on security issues like crisis management and so on. This part of the UNIDIR manages a wide range of research subjects and topics including armed violence, humanitarian activities, war analysis, the use of weapons, autonomous technologies and more. The division also offers related policies to the operations offices of the UN. The main duties of the fellows here are to study international humanitarian law, the relationship between different international disarmament institutions, the risk of the nuclear weapon, and the nuclear disarmament negotiations etc. This Office, which is in charges of strategic planning and institutional management, can be considered as a supportive department to the Director of the UNIDIR. The leader of the Office has rich experience in information and telecommunications. Furthermore, some dominant research issues of the Office include AI, cyber analysis, disarmament education and other related advanced technologies parts. So far, the Board of Trustees, who is picked by the UN Secretary-General, has in total 14 members from worldwide locations. All of these members have professional knowledge in global security, disarmament and arms control since some of them are ambassadors or professors from universities. 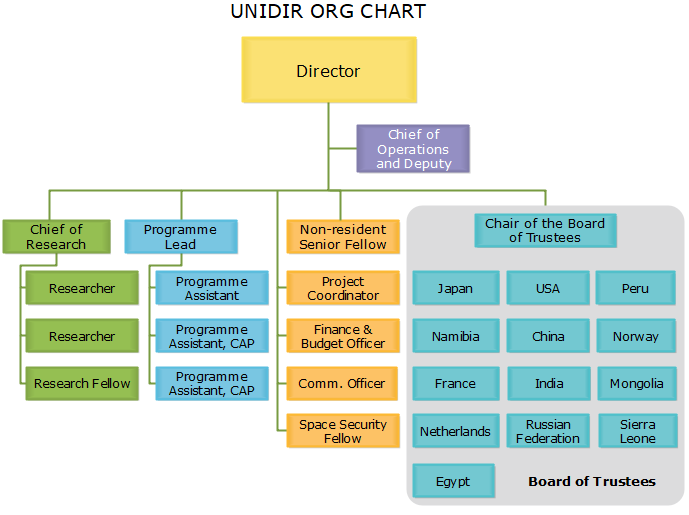 Wanna Learn Creating An UNIDIR Org Chart? Simply click on this org chart creator guide for a quick and easy start even without prior org chart design experience! Alternatively, feel free to operate this easy org chart creator for more advanced settings and management of your business teams.